Today I played for the first time with the Polka Dots and Paisley set, it was one of the ones I chose in my Starter Kit so I was sorry to find out it will be retired soon. It's a cute little set. It's been a miserable grey day so I wanted to make something quick and cheery. So out came the bold colours, I had to go for Real Red and white for the first play with the polkadots! And the Green Galore makes the red really pop. In making it I did "find joy in the little things" - the ability to play with new stamps, a roof over my head and relief from the hot weather last week. After watching events in Victoria this week I am so thankful for all the little things we have and usually take for granted, and my sympathy goes to all those who have lost so many "little things" as well as the big ones. 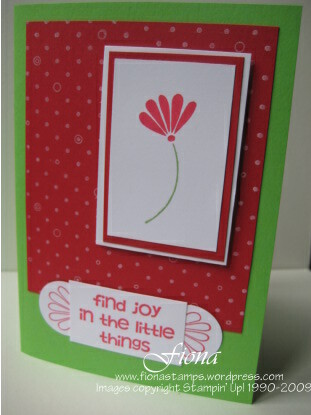 So I was happy to read that Stampin Up! have just announced a Bushfire Appeal. You can read all about it HERE. They are donating 50% of the retail value of all sales from a select group of 10 stamp sets. *These sets will appear on the upcoming list of retiring products, so they will only be available for the Bushfire Appeal--while supplies last.